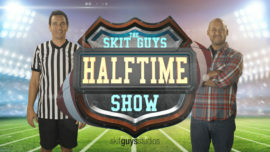 Keep your halftime family friendly with a safe and clean show from the Skit Guys! These videos have been tailored made to fit your halftime time slot. Grab your chips and dip and get ready for some tips to enjoy the big game. This is just long enough to cover your church's or youth group's needs for halftime. Get a clean, funny halftime show that the whole family will enjoy! 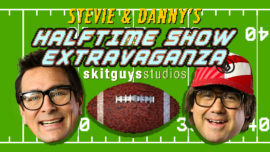 Grab some wings, your favorite jersey and a giant foam finger and join Stevie and Danny as they host the perfect halftime show to cover your church’s or youth groups halftime needs. Get a clean, hilarious halftime show that the whole family will enjoy!